�Snowfall� Exquisite Glass Photo Coasters - EconoBride - Budget friendly wedding favors. Imagine a gentle snow fall on an icy-blue pond so glassy-smooth you can see your reflection, then surround your guests with an image of the season so real, it will warm their hearts. 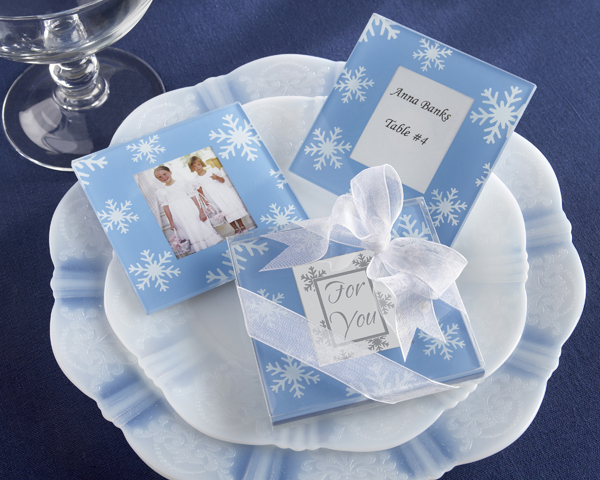 Just slip these �Snowfall� glass photo coasters next to each place setting, and your event will glow with the spirit of the season. With delicately designed snowflakes floating on a deep-blue winter sky background, these charming glass coasters measure 3.5� x 3.5� and hold a 2� x 1.75� photo�truly the epitome of a mesmerizing memento for your winter event. Each favor contains a set of two coasters.